Rushing to the copy shop before closing time to print an important document? Asking others to borrow their scanner to copy an item? Foregoing creating your marketing materials in-house as your home printer isn’t up to scratch for printing professional standard images? If this sounds familiar, it may be time to consider getting (or updating) a printer for your small business. We’ll provide a guide to five of the best printers for business. Whether you want to buy a printer for your business for the first time, or you want to upgrade the printer currently in use in your start-up, you can use our guide to help you make your decision. We researched the best printers for small business by looking at key areas, including affordability, expertise, and purpose. Click on the providers above to find out more about the best types of printer for small business. Or, if you’re ready to compare quotes for photocopiers right away, just fill in the form at the top of the page. Capable of printing in black and white, as well as colour, with a 300-sheet paper capacity and printing speeds of 31 ppm, the Brother HL-L8360CDW is ideal for small businesses that need to be able to print in different formats quickly. It offers environmental accreditation and quiet mode printing so could be more economical to run. Plus, its security features include an IP filter, as well as function and setting locks, which can help avoid unauthorised access. The Brother HL-L8360CDW is best for all-round printing as it offers black and white and colour laser printing, with multiple paper sizes available (A4, A5 and A6). However, it has a bulky design and weighs 21.9 kg – it’s one of the bigger size printers on our list. The Canon Pixma TS9120 Wireless Inkjet All-in-One offers black and white and colour inkjet printing. 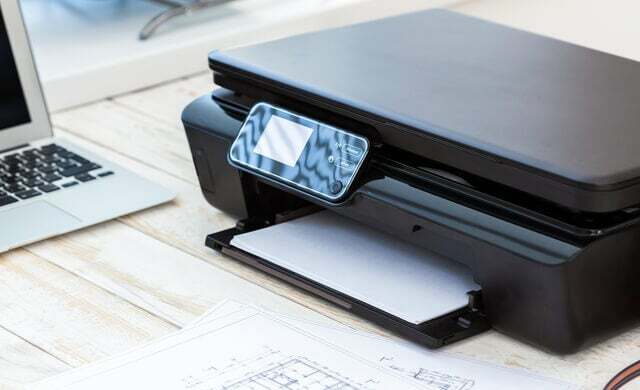 It can support cloud and Bluetooth connectivity, making it suitable for small businesses that need different ways to print. It’s best for home office printing because it’s a lower cost printer that’s capable of printing text and images, as well as scanning and copying too. While Canon targets it at consumers, it could be ideal for home offices or freelancers that only need to print occasionally, especially images and photos. However, it doesn’t have an automatic document feeder (ADF) so printing lots of documents that have multiple pages will be slow-going compared to some of the other printers in our list. The Epson WorkForce WF-7110DTW is an inkjet printer, equipped with all the features you’d expect, including mobile printing. This means you can print from your device, as well as emailing documents to the printer directly. It also has wifi and cloud (Google Cloud Print and Apple AirPrint) connectivity. It offers two paper trays, each with a capacity of 250 sheets and A3 size, making it the best for A3 printing. This is an affordable option, particularly considering its 18 pages per minute (ppm) print speeds and duplex functions, which make for quicker printing processes. However, it’s a tall machine with a small display screen so it might not suit all work spaces and users. The HP PageWide Pro 477dw is best for multi-function inkjet printing, as it offers faxing, scanning and photocopying as well as printing. Plus, it looks the part too, with its professional appearance meaning it should fit in well to an office environment. It offers high quality printing, capable of printing on A4 through to B6 paper sizes, as well as envelopes. With its 4,5000 pages per month and 55 pages per minute (ppm), this is a sturdy printer that should be able to handle the workloads of small businesses with five-15 team members. However, it might be lacking in style and convenience for image-conscious start-ups. Also, it’s at the higher end of the price spectrum compared to other printers in this guide. With the option to copy, print and scan, the Ricoh SG-2100N can print both black and white and colour documents quickly, at up to 29 pages per minute (ppm). Its control panel is located on the front of the machine, making it easy to access and control. Plus, it offers wireless connectivity, as well as the option to print from smart devices. The Ricoh SG-2100N is an ideal choice for small businesses looking to for a mono (black and white) printer only. It’s part of Ricoh’s GELJET series and so documents can print and dry quickly, making it the best for inkjet and laser printing. However, when printing in colour it can only handle low capacity cartridges. If you’re looking for a single function printer that can print mono (black and white) in a standard office environment, then the Samsung Xpress M2835DW could be ideal. It offers an eco mode so you can control the power and ink used while printing. And it has the ability to print from a smartphone, and connect wirelessly, giving you more ways to print. With 28 pages per minute (ppm), print-outs can be with you quickly. It’s best for single function mono printing because it can print quality black and white documents only, with a built-in duplex feature. However, if you need additional features – like colour printing, or copying and scanning functions – you’ll have to look elsewhere. From reading this article, you’ve learned more about the best types of printer for small business (including profiles of some of the top products out there) to help you find the best product for your business’ printing requirements. The next step is to figure out how much the type of printer your business needs will cost you – read our page on printer prices for more information. Another option is to compare quotes for photocopiers now – simply scroll up to the top of the page and complete the form. Here we answer some of the most common questions related to finding the best printer for business, including how to choose a printer based on price, as well as between an all-in-one or a laser printer. Plus, we provide some of the key benefits your business could experience from having a printer. 1. How do I choose the best budget printer? You could consider an all-in-one printer, as they offer printing, photocopying, scanning (and sometimes even faxing) facilities through one device. So not only freeing up space for other equipment or more room in your office, they provide cost-saving benefits too. Inkjet printers tend to be cheaper to buy and operate so are a good option for budget-conscious business owners. Although as the ink needs drying time, the print-outs are at risk of smudging. These are a smaller, more compact type of printer too. When calculating printer prices, consider the purchase cost, as well as any maintenance charges and ongoing expenditure. Remember that in addition to the printer price, you should also take into account the price of printer consumables too, such as paper and ink or toner. Plus, find out how much ink and other consumables it comes with, if any. It’s also wise to consider energy features, such as eco settings or auto-power off buttons. Review if these functions are available and if so, how they are operated and if your business needs them. These could help lower your business energy bills as your printer won’t be wasting electricity when not in use. Another way to lower costs could be to consider a subscription service for your printer ink, allowing your business to receive ink an ongoing basis (which could work out to be more cost-effective) instead of buying individually as and when you run out. Finally, don’t let the words ‘laser printer’ put you off – they’re not always more expensive than inkjets, and depending on your business’ needs, could be the best option for your printing requirements. 2. How do I choose the best laser printer for office use? Laser printers use toner to bond text and images to the paper directly. This means drying time isn’t necessary and print-outs will be smudge-free. However, laser printers tend to be bigger in size and more expensive to purchase and run than their inkjet counterparts. Generally, laser printers are more suitable for text-based printing, whereas inkjets are better for printing images and photos. If you do opt for a colour laser printer, this is more for printing charts, diagrams and graphs (for example) in colour. It’s worth noting that LED printers are another option, as they work like a laser printer, only with an LED instead – although often attract a higher price tag. If your small business only prints from time to time, say on a weekly basis, or less, then a laser printer is ideal. For those businesses needing to print every day, then an inkjet printer may be a better match. Overall, for the average small business looking to print a low level of text documents each week, a mono (black and white) laser printer is likely to be ideal. An all-in-one printer offers just that – printing, copying and scanning, in one device. Some models offer additional features too, like duplexing (printing on both sides of the paper), as well as hole punching and stapling, plus other more advanced functions too. They are also known as multi-function (MFPs) – a printer that only prints is a single function printer. MFPs can be laser or inkjet based. An inkjet printer will be slower when duplex printing as you’ll need to allow for drying time for each side of the paper. However, it’ll be quicker to start the printing process, as they need less time to warm up. If you need to print, scan, fax and copy a lot of multiple page documents then an automatic document feeder (ADF) function will make this process easier and quicker. If you’re looking for a printer that offers multiple functions and gets going quickly to print for a short amount of time (in a home office, for example) then all-in-one printers could be ideal. 4. What are the benefits of having a printer?